There is one major home improvement project that I’ve written very little about. Soon after we moved in, I went down a month long rabbit hole of learning about DIY alarm systems. The idea is basically to install the same level of hardware that a company like ADT would install, but skip the middleman. You install the hardware and you connect it to a monitoring company. We paid about $500 for the hardware and then $10/month for the monitoring. I wasn’t comfortable sharing the details of it in the beginning because I wasn’t sure how secure it was. That concern was probably unwarranted. 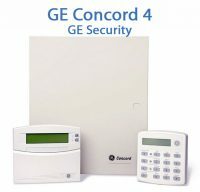 Our GE Concord 4 system worked flawlessly, but it was one of the hardest projects I’ve done. The hardware itself is relatively simple. All the sensors have two wires and they are either normally open or normally closed. The wireless sensors are easier to setup and just need to be paired with the base station. The catch is that the main circuit boards for these units are 1980s-90s technology. Forget connecting your computer to it and configure it. Instead you have to type incredibly long series of numbers into the keypad to change settings. For example, if you want to change a setting, you press 8, your four digit master system code, 0, 0, and the four digit code to select the right program setting. Then you actually get to make the setting which is usually a one digit number (on/off, number of seconds, etc.) The installation manual is 113 pages long. It’s intense. But you know what? I’m still glad I did it, partially because I learned something that was really complex and because it saved us a LOT of money both on the initial hardware purchase and on the monthly monitoring. 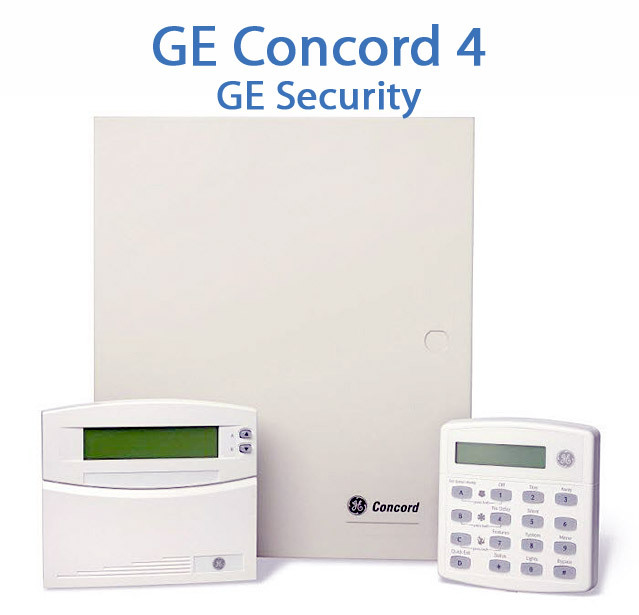 We have easily saved thousands of dollars compared to using a standard consumer alarm system. I’m getting tired of having a landline just for the alarm system. It wasn’t so bad when we moved in because our cell phones would regularly drop calls. Coverage and phones have improved and that’s no longer a problem. So the phone line really is just for the alarm. And no, you can’t use a VOIP line (like Comcast phone service) for an alarm. It has to be the old-fashioned POTS phone line. Well the good news is that since I custom installed my own hardware, I’m free to switch over to cellular monitoring and switch to a different monitoring company if I want to. The problem is that I REALLY don’t want to go down that rabbit hole again. I started looking into it and it’s pretty complex and the technology is frustratingly ancient. I’m sure it would work, but I don’t have the patience. Thankfully, a number of companies have stepped up to offer DIY home security products. You get the benefits of cutting out the middleman without the headache. This post is getting long so I’ll keep you in suspense until tomorrow about what we’re using now and how we like it. One of the nice things about helping to install my irrigation system is that I feel confident enough to make repairs or modifications on my own. But I recently learned that I’ve been doing part of it the (very) hard way. 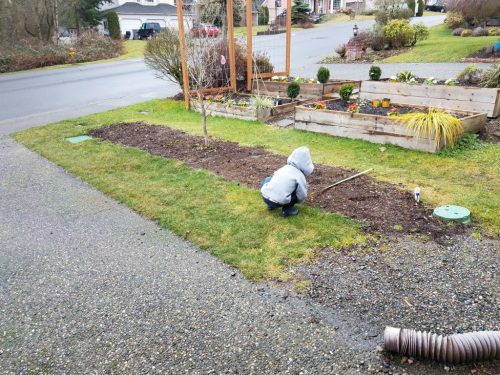 Most changes require cutting a pipe that’s already in the ground. To do that, I dig a big enough hole that I can get a hand saw or a sawzall in there. All I really needed to do was get down to the pipe with a big enough hole that dirt won’t get into the open ends and then use mason’s line to cut the pipe. 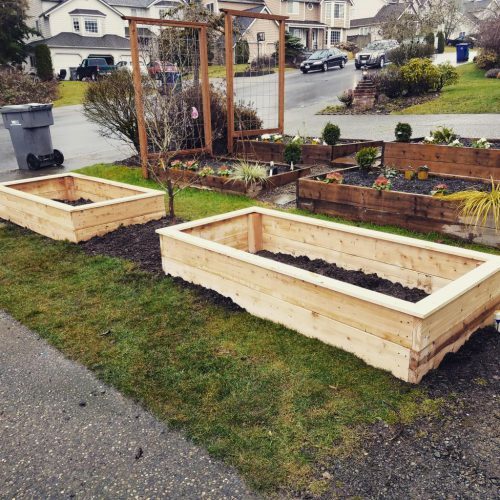 The garden box project is done and ready for sunshine. 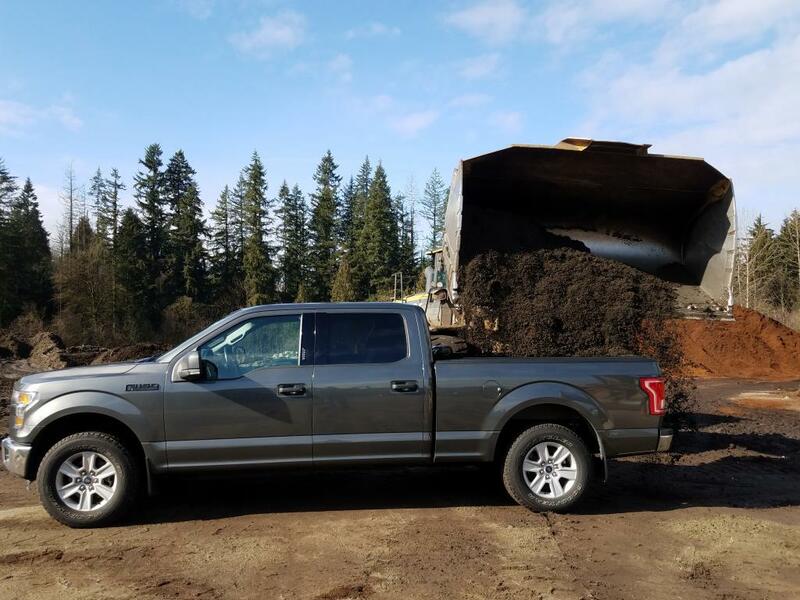 Elijah and I got a load half dirt, half compost) from Pacific Topsoils and filled the boxes. It took about 1.3 yards to fill the beds and thankfully they are generous with their loads there so my 1 yard purchase was perfect. I made a timelapse of the build and filling the beds. It’s fun to watch the truck rise up as we unloaded. The unloading was very easy since I could back right up to the boxes. 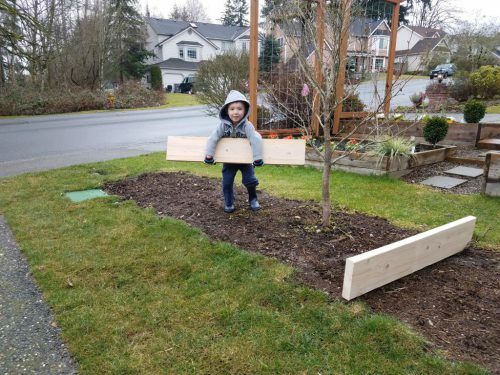 Elijah was having a BLAST helping with that part. It’s so nice to have my own truck to get these kinds of jobs done! A couple of our neighbors have pretty successful raised garden beds, and this year, Tyla and I decided to jump on the bandwagon. There’s a natural spot for them where the cherry trees used to be beside our driveway. It’s even plumbed for drip irrigation already. This was the first time I’d ever built boxes like this but I used our next door neighbors for inspiration. It’s basically two 2×8 boards stacked on stop of each other with 4x4s as the corner. I dug down to level the boxes out and then pounded 4x4s into the ground to keep the boxes in place. The ground was very soggy so all of that was pretty simple. The hardest part was just keeping the box aligned correctly. It was rainy pretty hard for most of my project so I skipped a lot of the steps that probably would have saved me time like staking a line to help keep everything straight. Elijah thought it was a pretty fun project and helped for a bit before it got too wet and he went inside. He was the smart one because I ended up soaking wet. I finished them off with 1x4s around the top partially to hide my mistakes and also as a place to set tools and sit down while weeding. I used cheap pine for this. I didn’t want anything treated since I’m not sure that is food safe. I should have probably used cedar but that was about $250 extra and I wasn’t willing to pour that much money in. We’ll let these go for 5-10 years until they rot and by then I bet I’ll have other ideas anyway. The next step is getting the drip irrigation plumbed to the right spots and then filling the boxes with dirt. Our house was built in 1990, and when we bought it, it still had the original combination microwave/oven unit. 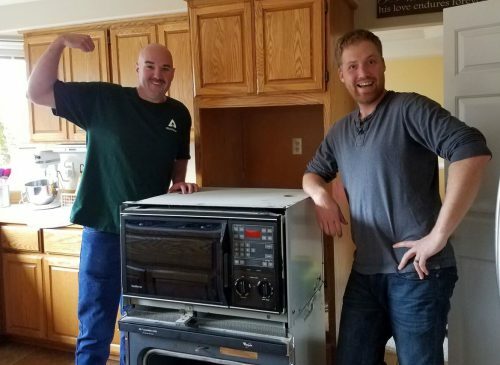 They worked fairly well so we just left them alone and marveled at how nice it will be some day to have cool new features like a spinning tray inside the microwave. The unit slowly degraded over time and the biggest annoyance was that sometimes the microwave would look like it was running, but when you took your food out after 2 or 3 minutes, you found out that it hadn’t actually been heating. It seemed like a problem with the door sensor so we each had our own routines of how to close the door to avoid that problem. We decided it was finally time to upgrade. Unfortunately there aren’t a ton of options for these combination units. I looked into buying two separate units and trying to work it into the existing cabinet space but I gave up on that* and handed over the credit card to buy a KitchenAid KOCE500ESS. Kudos to the Rick at Judd and Black for another great purchasing experience and what seemed like a fair deal to me. The new unit was a few inches shorter than the old one. That extra space generally is less noticeable at the bottom of the unit than at the top, but that means building a little shelf inside the cabinet space. Since the unit is hardwired into the 220v circuit, Judd and Black have to hire that out to a contractor. Couple that with the shelf building and the install fee was going to be around $250. For that price, I was willing to try it myself and I’m glad I did. And when I say “myself”, I mean with help of some cheap labor from Logan. Logan and I wrestled the old unit out of the cabinet and tossed it in the truck. Judd and Black took that one back at no cost and we picked up the new unit. It took us about 2 hours to install it, but that was largely due to my mistakes building the little shelf. It’s an extremely simple build with the tools I had in the garage, but there isn’t a lot of room for error between having a gap above the top of the unit and making the hole too short so that you can’t slide it in. 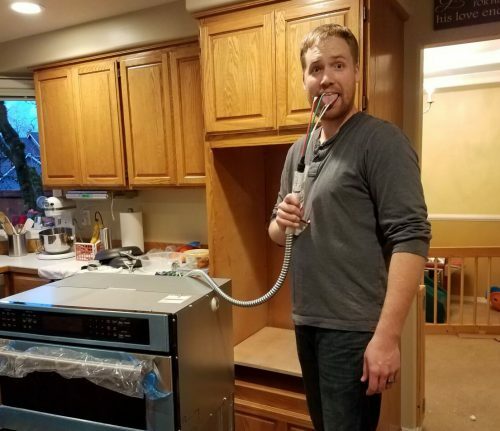 The actual appliance is really nice. 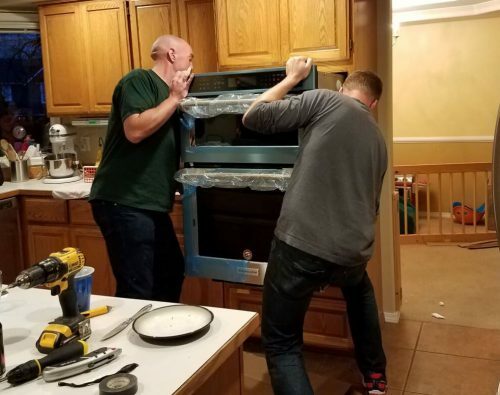 It has three racks in the lower oven, one of which extends fully out for easy access. The top oven is some goofy combination of a microwave, convection over and broiling unit. I don’t understand how it works, but in addition to using it like a regular microwave, you can do some combinations like using the microwave in conjunction with the broiling element to make crispy hot sandwiches or french fries. You can even put most metals in there. It works out pretty well and really speeds things up. For example, if you want to make a frozen pizza, you can bake one perfectly from start to finish in about 8 minutes. Compare that to the 10 minutes of pre-heat time and 10 minutes of cook time with a standard oven. But in general, it’s just nice to have a microwave that heats every time and an oven that heats evenly even with multiple racks full. Hopefully this unit provides us with a lot of delicious food for many years to come! * After we removed the old unit, I discovered that there was an extra 110 line coming into that cabinet. One of my hangups with doing separate units was that I’d have to run another line over there to power the microwave. Looks like the home builders already thought of that. If this new unit ever dies, I’ll probably give more thought to buying two separate units because it’s so much cheaper.